/marvel-spider-man-movie-high-school-cast/Earlier tonight, we reported that Marvel and Sony plan on sending Peter Parker back to high school in the new Spider-Man that is being planned. At this time, Sony, who will have the ultimate say in who is cast as the new web-crawler, are already targeting two young actors to play the role. In contention are Logan Lerman and Dylan O'Brien. The plan is to get someone younger than the 31 year-old Andrew Garfield, who previously played the role in The Amazing Spider-Man and The Amazing Spider-Man 2. Logan Lerman is 23 years old, but can still pass for high school age. Dylan O'Brien is the same age, and is equally youthful in his appearance. Sony, who has ultimate say over what exactly the new Spider-Man will be, plan to keep Peter at Midtown High School a little longer, as the main thrust of this new series will focus on Parker's awkward relationships with fellow students, and how he deals with bullies while at the same time protecting the city he loves as a crime-fighting vigilante in a superhero costume. Both Sam Raimi's 2002 Spider-Man and Marc Webb's 2012 The Amazing Spider-Man started Peter off at Midtown High, but in both series, he graduated and moved onto life outside of high school. It sounds as though this new iteration may keep him in classes for more than one movie. 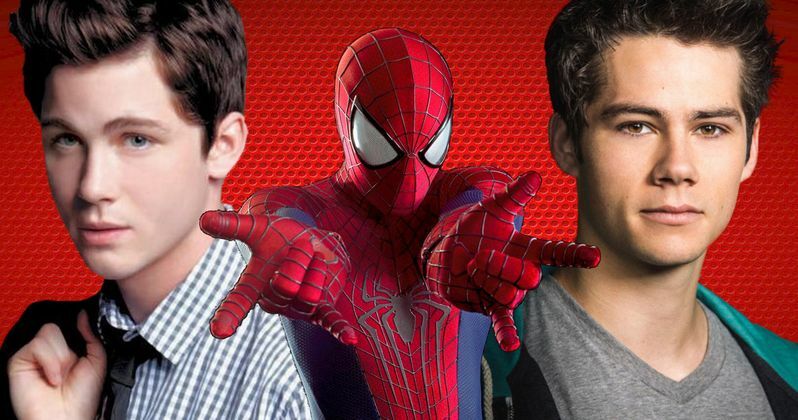 While Logan Lerman and Dylan O'Brien are being looked at for the role of Peter Parker, we shouldn't consider either of them true contenders just yet. While Marvel and Sony named Peter Parker in their press release, it is believed that the two studios are considering other iterations of the character, and may even bring in Miles Morales, a mixed race character whose father is African-American and whose mother is Puerto Rican, instead. Whoever the character is, he will be introduced in Marvel's Captain America: Civil War, which begins filming later this year for a 2016 release. So we'll probably know who Sony and Marvel decide on for Peter Parker sooner than later. Marvel's Kevin Feige and Sony's Amy Pascal will produce the new Spider-Man standalone adventure, which is set for release on July 28, 2017. Kevin Feige, however, won't be involved in the spinoffs, since he has an ambitious Marvel Phase Three slate to develop, which includes nine movies being released in the span of three years. Logan Lerman is best known for his roles in Fury and Noah. He also played the title character in Percy Jackson & the Olympians: Lightning Thief and its sequel Percy Jackson: Sea of Monsters. Dylan O'Brien recently took the lead in The Maze Runner, and will return for its upcoming sequel The Maze Runner: The Scorch Trials. What do you guys think? Do you like either Logan Lerman or Dylan O'Brien for this highly coveted part? Or do you hope they bring Miles Morales in this time around? Any suggestions? Sound off below!